Chinchilla lanigera, more commonly known as the chinchilla, is a crepuscular rodent, meaning the animal is most active around dawn. Chinchillas come from South America. They are mostly located in the Andes Mountains of Peru, Bolivia and Chile. The main population of chinchillas can be found in Chile and Peru. 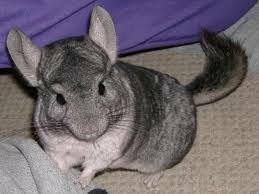 Chinchillas are known for their super soft fur and their cute appearance. Their fur comes in a variety of colors. Chinchillas are primarily born with gray fur but they can also come in colors such as white, black, and a blend of those colors. Chinchillas do not take baths with water because their fur is too dense. They take dust baths to keep their fur dense. A denser fur acts as a repellent to fleas and other parasites. Chinchillas are a bit larger than normal squirrels and their diet consists of barley, oats, salt, wheat, and hay. As cute as they may be, chinchillas are critically endangered mostly due to the fact that they are hunted for their fur which is in high demand for its softness and appearance. In the last 15 years, the chinchilla population has dropped 90 percent.